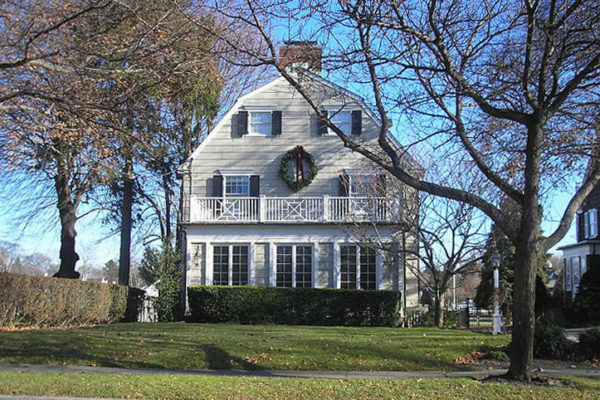 To get in the spirit of Halloween, here are some of the most haunted locations on Long Island that you and your friends can visit at your own risk or avoid at all costs. In the south shore village of Patchogue, off Grove Avenue, the “Hanging Tree” stretches its branches and dark history over Swan River. An alleged site of witch trial executions and suicides, visitors have reported various paranormal activities ranging from sensory distortions and electronic malfunctions to the presence of a “lady in white,” according to Michael Cardinuto, lead investigator of Long Island Paranormal Investigators (LIPI). Temperature fluctuations, which are indicative of ghost manifestations, are also common in the area, according to Cardinuto. Investigators have used infrared thermometers on trees and observed this phenomena. On one occasion, the temperature rapidly dropped 10 degrees and remained there for 30 seconds before gradually rising. Located in ritzy West Hills, Mt. Misery Road is the location of tremendous accounts of strange happenings including sightings of UFOs, ghosts and mysterious men in black. When Long Island was purchased from Native American tribes, settlers were warned that evil spirits were present on the hill. Then in 1840, a mental hospital was built on the grounds, according to Cardinuto. It was soon burned down to its foundation when a patient supposedly set her room on fire. Sacrifice is the predominant theme at another eerie local spot, Lake Ronkonkoma. The Lady of the Lake legend states that a Native American princess fell in love with a colonial settler, but was forbidden to do so. As a result, she committed suicide and vowed to avenge her inability to marry him by drowning a young man once a year in the lake. Over 160 men have died in the lake since 1893, according to Dave Spencer, a Lake Ronkonkoma historian. Another spooky spot is the homey wood-paneled pub, Katie’s of Smithtown, located on Main Street in Smithtown. Katie’s is reportedly haunted by a bartender, Charlie Klein, who committed suicide in the 1920s. Since his death, patrons have reported seeing the bartender himself, glasses fly in the air and people dressed in turn-of-the-century clothing. Perhaps the most famous haunted Long Island location is the Amityville Horror House, as it is referred to in popular culture, located in Amityville, a village in Babylon. In 1974, six members of the DeFeo family were shot dead in the Ocean Avenue home by Ronald DeFeo Jr., who claimed to have committed the murders because voices were plotting against him. Thirteen months after his conviction, the Lutz family moved in, calling the residence their home for a mere 28 days. The Lutz family reported evil forces taunting them with violent movements of inanimate objects, peculiar gelatinous substances and “Jodie,” a red-eyed, pig-like creature. The family had multiple groups of investigators explore their home, including the American Institute of Parapsychology and The Warrens, a married couple who investigated over 10,000 paranormal cases during their career.